Note: in February, I shared my thoughts during the primaries on why I believe Christian conservatives did not support Trump at the time. But now, the bitter, divisive election is over and the American media sure put up a good fight over the last several months. In fact, 91 percent of the media coverage on Donald Trump was negative. 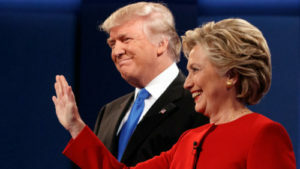 Fortunately, the people decided the outcome and chose not to believe the liberal media which intentionally gave the impression Trump was down for the count and Clinton would coast through election night to her acceptance speech while the crowds cheered. God will either have mercy on us by delaying His judgment or He will allow us to continue following the path of the lukewarm Laodicean Church of Revelation 3. For now, let’s not take for granted the short time and freedom we have in Christ and country. This election should remind us that we need to wake up and speak up, taking a stand for godliness and righteousness. This makes a lot of sense to me.Never thought about all of these things.Good article I will probably print and keep it..
Ironically, My ladies Bible Study is studying the Book of Revelation and we have just concluded the 3rd Chapter — The Laodicean Church. I was telling my ladies before the election just as you said, “God will either have mercy on us by delaying His judgment or He will allow us to continue following the path of the lukewarm Laodicean Church of Revelation 3. For now, let’s not take for granted the short time and freedom we have in Christ and country. This election should remind us that we need to wake up and speak up, taking a stand for godliness and righteousness.” I am convinced we don’t have much time left one way or the other. I continually pray God has MERCY on America, even though we don’t deserve it. Very good article. Trump will need our prayers. It’s time for America to repent and get on their knees and pray. Thank You David for this great article reminding us to be ever vigilant in paying attention to what is going on in our government, how God is prevalent in all things (Even though we don’t think so sometimes), and how we need to always be ever steadfast in prayer for not just those who are family and friends; but also for our leaders such as Trump who many of us are looking to for the rebuilding of the sound moral fiber, great and strong military and so much more of the great country God has allowed us to live in. Thanks so much for taking the time to read and comment. Let us pray for His will to be done. God bless you, brother! Intriguing. The devil is well known for obfuscating the truth and blinding men’s eyes. God’s part in this election was to let Trump win despite the fact that his agenda is inherently evil. “That which you do unto the least you do also to me.” Trump and the Tea-Party Republicans are just about to “do it” to all of, including the least (read poor and/or disadvantaged). God didn’t see to ti that Trump was elected. God let the devil work his corruption for whatever his (God’s) purposes may be….. Thanks for giving your opinion here, Phil. You may or may not be right. I’m wondering what your take is on the last eight years under Obama then?